When I read of a migrant mother and her newborn plucked from a migrant boat and airlifted to Malta a few weeks ago I was reminded of Chinese mothers making surreptitious plans to give birth ‘accidentally’ in Hong Kong. There is border control between mainland China and Hong Kong because of the huge difference in standards of living. A common ploy was for Chinese mothers to travel to Hong Kong in the final stages of their pregnancy and to induce delivery during their visit – Hong Kong offered automatic residency for those born on its territory. This was merely a bid by mothers to induct their newborn into a better life. The ploy became so common that Chinese authorities started to deny travel visas to visibly pregnant women. In Malta and Europe we cannot take such administrative measures to stop people, including pregnant women in the trimester, as well as unaccompanied children, from boarding overcrowded seacraft at the Libyan coast and setting off on a fateful trip across the Mediterranean to Europe. A report compiled by the United Nations High Commission for Refugees (UNHCR) last year showed that 12 per cent of migrants plucked out of the Mediterranean and taken to Italy were children. It must be grim for parents in sub-Saharan countries of origin to invest whatever money they may manage to accrue to fund their children’s treacherous journey to Europe. It’s an act of love and despair: losing your children by pushing them towards the dream of a better life in Europe. Migrants undertake this passage of desperation for a variety of reasons. Statistically, only about 40 per cent are ‘asylum seekers’ as defined by international treaties. And, in any case, many of the migrants fix their bearings on Europe instead of relatively safe zones close to home in neighbouring countries or other regions within one’s own country. This suggests that the more enterprising and tenacious migrants, including those who would qualify as asylum seekers, choose to take a flight across continents in search of safety as well as a better life. You can hardly blame them for temerity – who doesn’t seek to better his life or his children’s lives? – especially given the complexity of local factors as well as the wider misery in the sub-Saharan region: poverty, climate change, food insecurity, oppressive governments and overpopulation. The region’s wretchedness is getting progressively worse with exponential population growth in sub-Saharan countries. For as climate change and desertification make agriculture more unpredictable and tenuous, rapid population growth exacerbates the poverty and food insecurity. This is prodding the young and able to depart for Europe, and this has become something of the culture of entrepreneurship in villages at the geographic frontier – entire villages have been emptied of young men. At the receiving end, the influx of economic migrants from Africa and Asia, as well as immigration from eastern to western Europe, has put a strain on communities in substantial parts of Europe. The cumulative effect of these waves of immigrants is now tearing at the fabric of European politics. The direct, sustained political cost of immigration is that liberalism and the Left is increasingly disdained for its tolerance of ‘illegal’ immigration, and the Right and popu­lism is in the ascendant. Brexit is a convulsion within this political rupture. There’s much foreboding among centrist politicians across Europe now that popu­lists will make sufficient gains in the European elections in May to enable them to launch an insurgency on the EU from within. The European project itself is under growing strain from the political strife precipitated and symbolised by mass immigration from within and outside Europe. The discourse on immigration has become entrenched. Anti-immigrant rhe­toric is increasingly hysterical, while internationalists and liberals stridently stick to narrow talk of saving lives, and of international and historical obligations. This is causing wider political fallout. Dormant racism is reawakening on the one hand. And on the other hand, liberals cling tenaciously to a sense of entitlement of the high moral ground. The confluence of NGOs in Malta – normally active in gay, feminist, environmental and human rights issues – at the vanguard of protests overly sympathetic of boat migrants is hastening the coalescence of anti-liberal forces whose intention is to roll back the liberal advances of the past generation. Immigration is also the single most important issue that’s delivering voters to populists and fascists throughout Europe. That’s why it is causing jitteriness among mainstream politicians. And that’s what accounts for Joseph Muscat’s posturing: he has to appear tough with the boat people, and has to stand up to Italy’s Salvini, even as his government encourages mass immigration through other routes. Adrian Delia understands that immigration is Muscat’s vulnerability, and that explains his flirtation with rhetoric about the social threats of mass immigration – erosion of identity, perceived or real rise in crime, undercutting of wages by availability of cheap labour, and the housing crunch, with rising rents and costs eroding Maltese people’s affordability of housing and pushing people into poverty. In this atmosphere it’s become hard to discuss immigration with reasoned postulations. No attempt is even made to distinguish the type of immigrants causing which type of strain. For example, the rise in housing costs has little to do with sub-Saharan migrants arriving by boat. But the boat migrants setting off from Libya are the most visible affront of immigration, the most conspicuous among us, and the ones we can hit out at because of racist undertones and perceived illegitimacy. This has unreasonably turned them into a lightning rod for all the woes of immigration. Overall, high immigration tends to cause short-term strain on infrastructure and systems of assimilation. The long-term effect is harder to gauge, and although the bulk of studies show that immigration tends to be beneficial, immigrants do cause spots of complications, particularly if they cluster or end up in ghettos. Yet all of this is dependent on numbers: every community has an absorption rate and a carrying capacity. Everyone accepts that the scramble to Europe by migrants from Africa and Asia across the Mediterranean is undesirable and unsustainable. The NGOs that save people at sea talk of establishing legal and safe routes for migrants to Europe, but as the saying goes, the devil is in the detail. And when you consider the numbers – tens of millions of migrants in sub-Saharan Africa and Asia (including the Middle East) who are desperate to flee their forsaken home for a better life, and the weak governance of the source countries, the implementation begins to seem complicated. The numbers are simply overwhelming. In reality there is little that Europe can do except batten down the hatches, especially since immigration has become a gathering threat to the EU and centrist politicians. 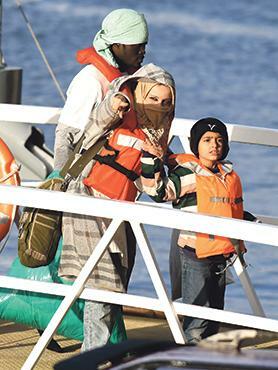 Talk of humaneness and compassion that saving lives at sea has to be above poli­tics makes good religion. But the reality is that immigration has not only become political, it is causing a generational convulsion in European politics. And in the run-up to the European Parliament elections in a few months’ time, politicians are acutely aware that their career is dependent in part on being tough on immigration, and that the liberal project itself is imperiled by immigration.